Salted peanuts. A common starter at many Chinese Food restaurants in Singapore. We normally have peanuts with a pint in the pub! Like Marley i would never have thought of peanuts during a proper meal. In a bar you would get some with your drink but that's it. From the thumbnail I though they are either jackfruits or mangoes...=) Great shiny macro! Is there sauce on them? They look wet. 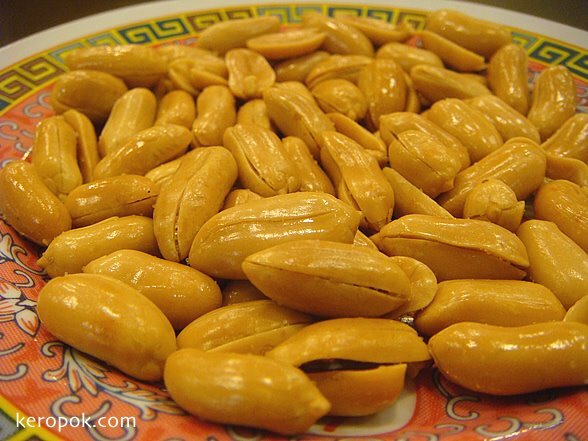 I love peanuts in Chinese dishes, and tend to order those sorts when eating Chinese food. Yes, like Marley and Ineke, I am used to salted peanuts as an accompaniment with the apperitif (with a drink). Those ones are so very shiny.